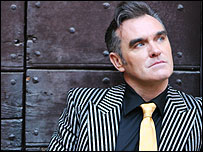 Former Smiths singer Morrissey will not be involved with the 2007 Eurovision Song Contest, the BBC has said. He first expressed an interest in taking part after Daz Sampson's song, Teenage Life, came fifth from last in the 2006 contest. "I was horrified but not surprised," he said. "Why didn't they ask me?" In January, the BBC said it was talking to the singer to write and possibly perform a Eurovision track but now says he "definitely will not" be involved. A spokeswoman for the corporation said: "The BBC approached several artists and Morrissey was one of those that expressed an interest. "Unfortunately, we were unable to go ahead with him being involved and we can now confirm that he definitely will not be taking part in this year's competition." Morrissey first found fame with indie group The Smiths, whose dark, brooding songs and social commentary on issues such as vegetarianism won a devoted following. The band also released a series of acclaimed albums, including The Queen is Dead, which regularly feature in critics' all-time best lists. They split up in 1987, after which Morrissey launched a successful solo career, scoring 10 top 10 singles in the UK. The winning entrant will compete against 23 other European nations in the final, which will be held in Helsinki after Finnish hard rock band Lordi won the contest in 2006.